May marks a time of change for many people; I think that I do not stand alone when I say that it’s a transitional period. For Canadian academics, it marks the end of the busy winter study term and the beginning of the arguably more relaxed and cheerful summer term. People begin to look forward to vacations, changing jobs, moving houses, and starting new relationships. I would even go so far as to call it a ‘liminal’ time period. In anthropology, liminality originally referred to the point in a ritual where a person stands at the threshold “between their previous way of structuring their identity, time, or community, and a new way” (Wikipedia article). More recently, it has come to refer to political and cultural change in which social hierarchies “may be reversed or temporarily dissolved, continuity of tradition may become uncertain, and future outcomes once taken for granted may be thrown into doubt” (Wikipedia article). It can refer to elements of time and space, and discussed in terms of scale or degree (Wikipedia article). Communitas is a concept that developed in tandem with liminality, suggesting a new social organization in which people interact based on common humanity and equality (Turner, 1969). May Day, or May 1st, is an ancient spring festival celebrated in the Northern Hemispheres (Wikipedia article). In keeping with the liminal tone of the day, it is related to the Celtic festival of Beltane and the Germanic festival of Walpurgis Night (Wikipedia article). These pagan celebrations are associated with joyous and hedonistic celebrations (Wikipedia article). However, May Day is perhaps best known for the tradition of dancing the maypole dance and crowning of the Queen of the May (Wikipedia article). 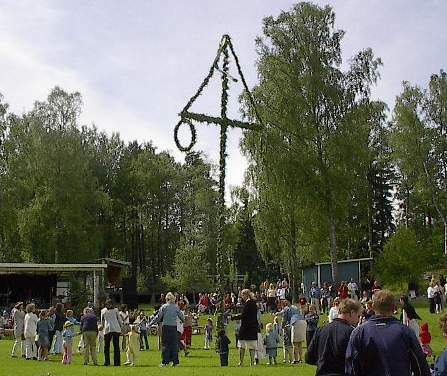 A maypole at a Midsummer celebration in Åmmeberg, Sweden. After the intense and stormy winter of 2013 to 2014 in Canada, the arrival of May Day feels particularly shocking to our collective systems. Added to this sensation is my own personal experience of being a non-student for the first protracted period in my life, and the growing pains that naturally accompany such a transition. I feel that I am moving through the fringes or borderlands of a great life change; I wonder if there are others out there who feel similarly. Only time will tell what the next stages of my growing ritual will entail! Are you currently going through the beginnings of a life change? Please comment below to share or Tweet me @legault_maria!